Each of these white-coated mammals share ancient Earth history. Their cultures preserve millions of years of matriarchal teachings, of living on the Earth as apex guardians over entire ecosystems, from the plains and woods of America to the savannah grasses of Africa. Their purpose, I dare say, is far greater than many of our own. The Earth will exist well without humanity stripping her of resources and destroying her metasystems. She will not thrive without her animal stewards tending to her bodily kingdom that we call nature. Preserving these endangered animals and bolstering their populations is the wisest approach to building resilience for the continuation of all life on Earth. What these animals said in 2013, when gathered in a visionary convocation with me, was: “Save as many of us as you can.” Yet these very animals are most targeted by human hunters and thieves—those who trade in animal body parts or live wild animals for captive hunting camps, or enslavement in zoos or circuses. The White Bear, Lion, Elephant, Wolf and Buffalo are each said to be reminders of the last Ice Age. The indigenous communities that revere these great beings tell how these animals speak about profound climate and Earth changes and how they have arrived to help humanity survive another time of upheaval, which today we are clearly beginning to experience. All human cultural traditions in which these mammals are treasured share similar prophecies. They each point to the star systems these animals are represented by, such as the Great Bear (Ursa Major), Leo, and Sirius, to name a few, as well as their association with off-planet elders, such as beings from Sirius, the Pleiades, Lyra, Alcyone, and elsewhere, according to the native lore about each White Spirit animal. As legend recounts, White Spirit Animals are homo-sapiens’ equals, and their species have helped restore life on Earth through trans-species telepathy in our shared past. Trans-species telepathy is an art that I practice and used in writing this book, and it is a communication process used by all shamanic traditions globally, enabling humans and animals, as well as humans and elements of nature, to communicate with each other. We see this across time in all human cultures, from Daniel talking to the lions in the den where it was expected he would be devoured, to a modern elephant whisperer, Lawrence Anthony, who upon death was visited by elephants he had not seen in over a year, but who knew telepathically that their dear protector and human champion had died. An animal more common to western culture is the wolf, who has been demonized more often than not by ecclesiastical institutions, government agencies and politicians, cattle owners and hunters. Yet indigenous cultures regard wolves as closest of kin to human beings; our brothers and sisters since creation. Wolves were once thought to be the most populous of the medium scaled land mammals, while today they are threatened with extinction. 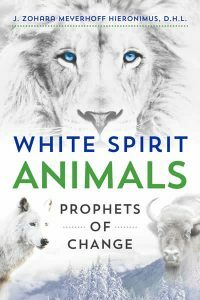 I wrote White Spirit Animals, Prophets of Change as a result of a waking vision wherein a convocation of numerous White Spirit Animals came to me in March of 2013 and asked me to tell their story. Using shamanic dream practice allowed them to share—through my dreams—what they felt was most important; enabling them each to tell their stories in the manner they wanted them told. In addition, I studied their societies, biology, and the wisdom teachings associated with them, and can say unequivocally that they are great and wise Earth stewards, teachers, and kin of humanity urging us to right action and reverence for all life. What they share is in keeping with indigenous communities globally: an expressed reality of reciprocity between humans and all life forms, both those visible and invisible. As such, the shamanic art of trans-species telepathy is becoming awakened across the globe in every receptive human being open to hearing animals and all of life talk. Survival—theirs and ours—may very well depend on this elevated collaboration. Following is a partial excerpt from White Spirit Animals, Prophets of Change, concerning shape-shifting and the White Wolf and their roles dating back centuries. The White Wolf has a long association with shamanic cultures worldwide. Much like the star system Sirius A, the brightest star seen from Earth, which represents Wolf in the heavens, the White Wolf remains a guide for human beings. Like the other White Spirit Animals, Wolf’s white coat is often said to be a reminder of the last glacial age, which ended 12,500 years ago. White Wolf is known as a shape-shifter and telepath of excellence. Researching Native people’s stories, it is fascinating to find how few are actually about White Wolf, but rather about how White Wolf is held in such high regard when she appears. Tamarack Song, founder of the Teaching Drum School and author of several books about tracking and communicating with animals and nature, lived with wolves whom he raised from pups. He explains why white wolves are so revered. “…White Wolf is a phantom wolf, a spirit wolf. In traditional culture this is not mentioned; not given voice. So you might hear or read a story or legend about wolves and White Wolf is not going to be mentioned. Tamarack’s explanation during an interview with me on 21st Century Radio in 2015, prompted me to recall that the Tsimshian tribal peoples of the British Columbian rainforest never spoke to outsiders of the White Bear either. They never even admitted to seeing White Bears, or knowing where they were. There are numerous stories of Wolf’s shape-shifting presence and close association with humans. In one of my telepathic dreams, a mixed-color wolf stood before me in front of a tipi. Smoke was rising from an early morning fire and one could see frosted breath in the chill of the season. Wolf was standing among other Native people, though clearly he was a wolf, wearing blue pants, a yellow shirt, and black suspenders. Slowly, carefully, he began to fill his animal-skin medicine pouch and showed me the items he carries with him: pine needles, sage, a flint, and a string of shiny metal beads. He indicated that the beads were to attract both birds and fish. Wolf carried bear claws on a string as well. Dreams have so many levels of meaning but it would not be unreasonable to wonder if this was a dream about a wolf-allied shaman. Or perhaps I was being shown the prevalence with which humans and wolves have exchanged identities over the millennia and the reputation Wolf has of being a medicine healer, an ally of Bear, whom I know as Chief of Medicine. The way I heard it in telepathic conversation with the spirit of the White Wolf was that “wolves do human,” meaning that they understand us. They speak our language. Consistent with other Native White Spirit Animal stories, creation usually involves one or more animals. The Quileute peoples of western Washington and the British Columbian Kwakiutl teach that their ancestors were actually wolves who became men. Shape-shifting myths are sometimes called “therianthropy,” which is the capacity of a human being to be transformed into an animal. Found among shamanic cultures involving Bear, Lion, Buffalo, and Elephant, when it pertains to humans becoming wolves the phenomenon is called lycanthropy. In this case, a person turns into a wolf and then may or may not return to human form again. Wolf, I have come to know, is a genuine way-shower, protector, and important ally of humankind. She teaches us community balance, giving the weak and strong, the young and old a role to play. She and her mate show us partnership and enduring commitment to our young and larger family. Her magical ability to appear and disappear, to guide humans and other species on the trail of spirit, is mysterious—playful and life changing at the same time. St. Francis of Assisi is said to have befriended a wolf in the city of Gubbio. After talking to the wolf about devouring livestock and frightening the people, St. Francis told the wolf he must stop his rampage. But then the wolf told St. Francis that he had only hunted out of hunger. At this, St. Francis walked with the wolf throughout the town, whose residents agreed thereafter to feed the wolf regularly, and all troubles ceased. Wolf’s intimacy with us is apparent by the millions of humans who to this day feel closely affiliated with Wolf, as they do with Dog. This bond may be hardwired into our limbic system, as Tamarack Song suggests, from the millennia in which we hunted together and learned together in order to stay alive. Like a lost branch of a family reunited with its clan, Wolf’s vibrant effort to be present in our lives, to keep their native ecosystems rich and the various ungulate herds healthy, is something Wolf wishes for humans also. Wolves encourage humans to be of service in the world, and to perform “CPR”: conservation, preservation, and restoration. While I cannot say for certain how the interplay of physical vessels between human and animal takes place in shape-shifting, it does seem that animals are perfected emotional beings. The astral body, our emotional body, is animated by a vital force that streams through the flesh and blood of our physical bodies. It is the astral body that seems to intermingle and conjoin animals and humans through our shared feelings and through a natural or elevated empathic response. Using animal pelts and bones, performing songs and dances, paying close attention, and incubating dreams regarding each animal stimulates the subconscious and elevates it to a kind of superconsciousness. In this state of the mental or causal body, ideas are pulled down into the astral or feeling body where they then manifest in the physical world of form and action. This process is similar to the way an architect’s drawing begins as a vision or an idea and is then rendered into drawing form, whereupon builders take it and create a physical building. We are drawing down from the invisible but knowable realms all things that are Wolf-related. In esoteric teachings one learns that all forms are related in octaves of similars. Much like octaves on a piano, similar notes, though of different frequencies, have resonance with each other. A low ‘C’ and a high ‘C’ will vibrate in harmony. As such, the image of something evokes its nature and presence in our lives. “As above, so below” is the hermetic way of expressing this basic law in creation another way, as well as adding “As without, so within.” The same processes are at work in human consciousness. Our intention, awareness, and emotional investment in the symbols themselves enlivens them, because we are paying attention to them, attributing meaning to them. Animate and inanimate totems in Native societies function similarly and, for this reason, ritual tools in all religions are actually able to facilitate a shift in human consciousness. The focusing of attention in this way, as quantum physics shows, is what enables the mind to observe how the immaterial realm comes into form in certain patterns. When we glimpse a photo of a loved one who has passed away, or we think of them, we are literally calling them up in the universe. Our attention makes the “other” accessible. It also allows for our intentional love to connect with them outside the bounds of either time or space. Afterlife communication, or communication with the deceased, which I have experienced since childhood, may also function in this manner. Sometimes I have heard from people I do not know but who ask me to bring a message to someone I have met, even in some chance place like a grocery store line. While it seems wishful thinking to say that love is the field of all potential, and that love is the field of life through which all languages flow—be it of the lion, the elephant, or the wolf, the tree, or the river—it is this field, this divine spirit of love, that permeates everything. It arouses in us, when we open our hearts to it, a profound feeling of connection that makes telepathy operate in people naturally. Telepathy understood in this way as a practice can become a life-enhancing skill. This kind of shared acceptance and reverence is highlighted in numerous teachings. The aboriginal peoples of Australia preserve “dreamtime” as a function of daily waking life. They communicate primarily through telepathy. Whether as leaders or managers, nurturers or guardians, Wolf teaches humans how to work together. Wolf also teaches us to use insight and patience to assure the well-being of the Great Spirit, which takes part in everything that happens on the entire Earth. White Wolf may not be seen everywhere, but she is everywhere and calls us to her, howling across the world drum. Zohara M. Hieronimus, DHL is an award-winning radio broadcaster, author, and social justice, environmental and animal activist. She has been called a visionary and futurist and is as well, a trans-species telepath who communicates with animals both wild and domestic. Zohara is well known as a broadcasting personality, hosting numerous radio shows over the past 30 years, continuing with her husband Dr. Bob, to host 21stCenturyRadio since its founding in 1986. Zoh is author of The Future of Human Experience, Destiny Books 2013, Kabbalistic Teachings of the Female Prophets, The Seven Holy Women of Ancient Israel, Inner Traditions International, June 2008 and Sanctuary of the Divine Presence, Hebraic Rituals of Initiation and Illumination, Inner Traditions, 2012.